Voices from the Field philosophy| Voices from the Field(VfF) introduecs translated field reports. It describes small but true figures of affected area of Japan's Tsunami and Earthquake,March 11.2011. 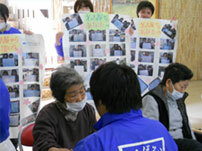 More than three months have passed since the March 11th, 2011 Higashi-Nippon (Eastern Japan) Disaster. Triggered by a mega-earthquake and immediately followed by a gigantic tsunami, the last three months must have been like a limitless time of grief, agony and despair felt by the people in the disaster-stricken fields. Even in their extremely severe situations, however, there seem to be communities of people who never give up, fighting every day with never-ending hardships, not necessarily without fear but rather struggling to survive. Yes, there are already a lot of voices heard, day by day, and week by week, from the disaster-stricken fields located here and there. The voices talk about their worries and concerns, struggles and challenges together, thus calling out for a beam of light and hope. Naturally but somewhat regretfully, most of the voices can only travel so far in their mother tongue, Japanese. This language barrier is a large communication deficit. 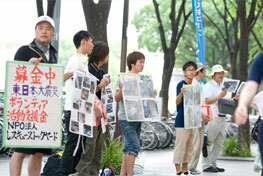 Are their voices reaching most of you who live outside of the afflicted regions, particularly outside of Japan? If YOUR answer is “No”, this news report titled “Voices from the Field | Japan Earthquake and Tsunami” is addressed to YOU and anyone like YOU who wishes to hear their voices. We assist you by spanning a bridge between the language of Japanese and the global language of English. Perhaps there will be different audiences including you who may wish to read our reports. Some of you may find yourselves somewhat helpless even at this moment, frustrated about how little information is available, particularly from the actual places where people are suffering. Perhaps YOU may also be irritated by your own lack of capacity to extend YOUR support to the people who still suffer. We hope that those who visit our website will become a frequent visitor, motivated to share with others our news reports which will be released on a regular basis.